Since I head in to our friendly northern neighbour’s occasionally, I thought it’ll be good to install a bike alarm. While it won’t defend against a truly determined thief, it helps repel the lesser skilled ones. Being the cheapo that I am, got the most basic system for about the cost of 2 Big Mac meals. No immobilizer, no blinking lights, no two-way system, no GPS tracking, no frills, no nothing. Merely screams at 110dB when the bike is moved, or is turned on when the alarm is armed. Super easy to install too – just 3 wires. 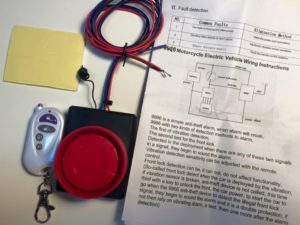 12v, ground, and a wire to detect if the bike is turned on (optional – can cut away if not used). Comes with a remote controller too. May I know where you ordered this alarm? I cannot recall. I typically get them from various online stores – typically dx, gearbest, alibaba, taobao, aliexpress, banggood, geekbuying, just to name a few.